My husband and I decided to try and start a family when I was 39 years of age. We did not have any idea that it might be too late. I went to my doctor who sent me to an OB who specialized in treating women for infertility. After all the testing, I was diagnosed with premature diminished ovarian reserve because of a high FSH count. My count was between 13-17 and I was told it had to be under a 10 to be able to get pregnant. I went on Clomid for 5 months which gave me terrible side effects and did not work. I went to two of the most famous fertility clinics in San Francisco and both places told me that due to my high FSH, that it would be unlikely for me to get pregnant with my own eggs and that I would not be a good candidate for IVF unless I got donor eggs. They both told me that my odds to get pregnant with IVF were 3%. At that time my friend suggested that I try acupuncture and Chinese medicine. I was fortunate to find Dr Lee who is amazing and she very patiently worked with me for months until I got pregnant in January 2007. Dr Lee got my FSH down to a 9 which was under 10 but the other doctors told me that it did not matter because in Western medicine, the original FSH count was the one that they went with. Due to no fault of Dr Lee or myself, we were unfortunate with that pregnancy as the baby had medical complications and did not make it. Dr Lee worked hard to help me recover from that pregnancy and once again work towards another pregnancy. I have to say that my heart was broken from the loss of the baby and I knew that it would be difficult to heal myself from the heart ache. My FSH level was now at 25 and I was a year older. Dr Lee did not care about levels, she said if I was able to get pregnant once, I could get pregnant again. She said that I only needed one good egg. We got that one good egg in February 2008 and my beautiful, perfect daughter was born in November 2008 just in time for Christmas! Both pregnancies took about 6 months of acupuncture and Chinese herbs which I also took for the first 14 weeks to prevent miscarriage. I was 42 when I delivered our beautiful daughter and I am returning to Dr Lee to see if we can work on one more! Our baby is truly a miracle with the help of Dr Lee and if anyone would like to contact me regarding treatment with Dr Lee please E-mail me at Suekerry@sbcglobal.net. Just to add to this wonderful miracle story, I returned to Dr Lee to try for one more baby which of course I wanted a boy…. This time it took a little longer as I was working with next to no follicles. I would not give up and neither did Dr Lee. After much work with Dr Lee, I got pregnant again in 2010 and landed my gorgeous baby boy in January 2011. At this point I was 44 and we are over the moon. This is an end to a truly fantastic story. Dr. Lee, we can't thank you enough!!!!!!!! I discovered Dr. Lee's website by chance after I had given up on IVF and other treatments. I was 37 years old but, according to my IVF doctors, my hormone level was more like somebody who was over 40. My FSH was high. I had IUI, IVF, and donered egg transfer, all of which had made my hormones go even more out of whack. My period was reduced from two to just one day. The philosophy and concepts Dr. Lee wrote on the website made me decide to try her treatment. My IVF doctor did not cared to know about my long term constipation problem, my cold hands and feet, or my low blood pressure. At the time, all I was trying to do was to get my hormones back to a more reasonable level. I was afraid that I was going to have an early menopause. Dr. Lee prescribed weekly herbal medicine which I boiled and drank for 6 months. I also took the acupunture. The pregnancy came as a surprise in July. When I realized I missed my period, I almost bought a menopause testing kit instead of a pregnancy kit! During the early stage of my pregnancy I still kept going to see Dr. Lee, especially the first 10 weeks before my first OBGYN visit. I had bleeding and cramps for 5 days around week 6 or 7. I called my OBGYN but I couldn't get pass the front desk. I thought I would lose this pregnancy. At the usual Saturday appointment, Dr. Lee gave me some medicine which stopped the bleeding and cramps by the next day. I was extremely relieved. In March 2008 we had our baby daughter. She is now a funny little girl. Now we are tired but happy parents. Thanks to Dr. Lee. Until now, I did not know why I could not be pregnant and needed to do IVF. After four failures, my husband still encouraged me to do it the fifth time. I refused. It was because he could not realize my physical suffering caused by injection and medicine from IVF. One day, one of my colleagues introduced Dr. Lee to me. Though I knew nothing about Chinese Medicine, I went curiously to her office. Dr. Lee’s analysis of my condition sounded very reasonable. During each IVF cycle, I had rapid heartbeat, insomnia, anxiety, sweat and fear of hotness. At ordinary times, I felt hot easily and I had hunger, thirst, quick temper, sleeplessness, constipation, rapid pulse etc. Dr. Lee said I had functional excess; and the drugs used in IVF treatment made me even more excessive. Therefore, after implanting, the embryo could not stay peacefully in the uterus and miscarriage occurred. Dr. Lee said though I could get pregnant by IVF treatment, I could not hold the embryo. Dr. Lee gave me four months of Acupuncture and Chinese Herbal tea. My physical health was so much improved. I could sleep, I felt peaceful instead of impetuous and I had never felt so relaxed before. After half a year, just by the time that Dr. Lee encouraged me and my husband to use IVF again, I became pregnant naturally. We were extremely happy, and in the meanwhile, nervous. Dr. Lee continued to guide me and bring my attention to some important issues. She conscientiously convinced me to keep on with the Herbal tea and I followed. God had given me this gift and I had to accept. In 2004, when I was 38, I gave birth to a baby girl. My husband and I are still seeing Dr. Lee whenever we have health problem. 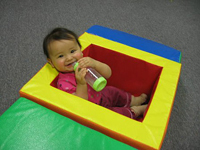 Dr. Lee is a dedicated doctor and we feel happy and comfortable to see her. When I am cuddling my daughter, I really dare not believe this is true. She is the most precious present in all my life. Our dream has come true. My husband and I have been married for fifteen years. We were hoping to have a baby, but each time I got pregnant, I had miscarriage. We were healthy, but nobody could find the reason for those six miscarriages. While we were getting older, we almost gave up until we had a conversation with Dr. Lee, and we were filled with confidence again. According to her plan, I drank the Chinese Herbal tea for five months. Is it a long time? No, definitely not. It cannot compare with our time of waiting 15 years for pregnancy. The five-month-treatment turned out to be the most precious present. How we can’t thank Dr. Lee from the bottom of our hearts! In 2004, I was pregnant again, and I continued with herbs for three more months. I understand that my problem is the difficulty to keep the embryo safe. So, the prevention of miscarriage is most important to me. Now, I believe that with Dr. Lee, you can find your confidence and the answer. Because I had abnormal sperm count, my wife couldn’t get pregnant since we married eight years ago. For this, I had seen nearly all the famous Chinese doctors in Bay Area. Then, one of my friends introduced me to Dr. Lee. I did not know much about her and her treatment. I even asked her: “Do you guarantee the success? If not, I don’t want to try again.” Dr. Lee analyzed my condition and explained to me from modern medical viewpoint, “Medicine is scientific, and can’t guarantee. If you believe in me, I will help you find out the root cause and give you the appropriate treatment. Otherwise, you’ll lose an opportunity. Your previous failure lies in that you haven’t found an experienced doctor.” She let me decide. Her words reminded me that why my sperm count became less and less after the treatments by so many doctors. I decided to let her make the diagnosis and give me the treatment. When Kevin came to my office, I found his previous diagnosis was wrong, his treatment inapproriate. He was a Virus Hepatitis B carrier and his sperm count was low. He had a hot-natured condition such as thirst, yellowish urine, sweat, red checks, insomnia, anxiety, rapid pulse, red tongue and less coating on the tongue. It is true that the normal treatment of male infertility by Traditional Chinese Medicine is to tonify kidney and increase Qi and blood, etc. However, in Kevin’s particular case, if the normal approach was adopted, his condition would only get worse. 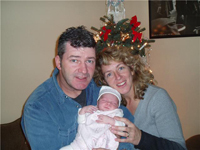 The root cause of Kevin’s infertility was Qi stagnation in the liver. Once the correct diagnosis was made, I gave him the appropriate treatment. Three months later, his symptoms were obviously improved. He became more and more confident. One day, when I was having dinner, the phone rang. I was wondering who the caller was, for it was late at night. It was Kevin. “Dr. Lee, I have good news. My wife is pregnant. I don’t know how to thank you? ...” I could feel his excitement. He wanted to give me the whole world. Frankly speaking, each success brings me gratification and happiness. I feel happier than the patients themselves. When our first child was twelve years old, my husband and I decided to have another one. I was forty-two years old at that time and I just couldn’t get pregnant for years. So, I went to Dr. Lee’s clinic. Dr. Lee said my menses and ovulation were normal; the only problem was that the reproductive function was not as strong as young people. She also said there was still a chance though the opportunity of success was relatively low. I took the treatment, drinking Chinese Herbal tea for four months. Just as expected, I got pregnant in the fifth month. Then I continued with the tea for three more months to prevent miscarriage. When I was forty-four years old, I had a natural labor to a baby girl, who was even healthier, stronger and smarter than my first daughter. Surprisingly, I got pregnant for the third time naturally the next year. That was a miracle. The herbs I took for more than half a year made me much more healthier than ever. I understand that it is the effect of Chinese Herbal Medicine.